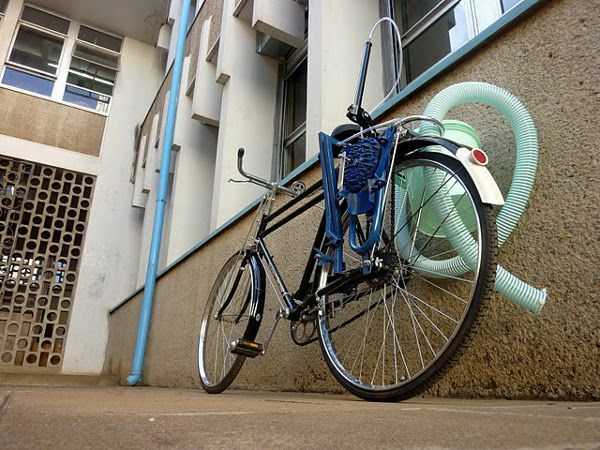 A new bicycle-powered latrine pump could redefine low-cost sanitation in developing countries. The pump makes work easier for latrine shovelers, who empty a latrine’s sewage pit when it’s full. The pump’s inventor, Nate Sharpe, is part of a team of MIT engineering and business school students who formed Sanergy, a group that’s working to improve latrine designs and convert human waste into usable energy. A new bicycle-powered latrine pump could redefine low-cost sanitation in developing countries. The pump makes work easier for latrine shovelers, who empty a latrine's sewage pit when it's full. The pump's inventor, Nate Sharpe, is part of a team of MIT engineering and business school students who formed Sanergy, a group that's working to improve latrine designs and convert human waste into usable energy.